Well, I think we all need to catch our breath after that, but there is plenty more play-off action to come this weekend. Tomorrow, Preston take a 1-0 lead to Chesterfield in the second leg of their League One play-off at 12:15 BST. And then at 18:35 BST we're back to League Two as Stevenage entertain Southend in the first leg of their tie. Don't forget we'll have live text commentary on all the play-off games. Thank you for joining us, goodnight. Plymouth Argyle boss John Sheridan tells Sky Sports: "We made it tough. I was pleased with the way we played in the first half but to find ourselves 2-0 down we were struggling and then you go three (down) and you're down and out. "But credit to the players they responded well and they've given us a chance. We can go there believing. It's 3-2 and we're right back in the tie now." Wycombe Wanderers boss Gareth Ainsworth tells Sky Sports: "What a game. Our fans were fantastic. "A 1-0 lead we've got going into the next leg, we'd have taken that this morning. At times it looked like we could have had a 3-0 lead but nobody has come here and done that to Plymouth. "I'm really proud of the boys. I knew they'd have chances and they took them well. "We start again on Thursday. We're going to have to cut out the mistakes and capitalise at the other end. The noise at the full-time whistle was deafening. The home fans must have thought their side were out of it. Plymouth hadn't had a shot on target for the first 85 minutes. What a turnaround in the final five minutes and it was John Sheridan's substitutions who made the difference. Zak Ansah surely will not have scored a better goal than that - it arrowed into the top corner. Jason Banton looked lively from the moment he came on, but there will be plenty of questions about the defending which allowed that ball to sneak through and into the back of the net. The second leg at Adams Park on Thursday is well and truly alive. "For me, the best two players for Wycombe were the two centre-backs - Mawson and Pierre. Bean and Jacobson were fantastic as well. "Wycombe were looking at a 3-0 win and it was looking a hard tie to go into, but Plymouth have been given two goals and it opens up the tie for a fantastic second game at Wycombe on Thursday." Well I don't think anybody was expecting that. Plymouth looked down and out at 3-0, but two late goals have given them a great chance in this play-off tie. We're into six minutes of stoppage time. Can Plymouth find an equaliser? Surely not? "Jason Banton got a yard, dropped his shoulder, and I'm so happy for the lad. He's come on and been lively. "Wycombe will be fuming because, in the second half, the substitutions seem to have worked. Banton's ignited the game. There's six minutes left and Plymouth will be looking at the opportunity of getting a draw." This is unbelievable! Plymouth are back in this! Jason Banton jinks his way into the box and hits a hopeful shot towards goal, which goes through a static Wycombe defence and into the middle of the net. Alex Lynch was completely wrong-footed in the Wycombe goal. Erm, I just said Plymouth had not registered a shot on target all night - they have now. Substitute Zak Ansah picks up the ball on the edge of the box and fires an unstoppable shot into the top left corner. A fantastic strike that gives the Pilgrims a little bit of hope. The hosts are on the front foot now, but they still can't find a way through this Wycombe defence. They've been magnificent all night. Plymouth haven't had a shot on target and we're now into the last five minutes. Scott MacDonald: Wycombe have been doing this all season. Defence magnificent and scoring goals from all areas. James Perrett: Come on Wycombe!! Deserved the win! Best performance of the season. Alex Lynch hasn't really been tested in the Wycombe goal tonight but he hasn't looked particularly confident dealing with crosses. He flaps at a high free-kick sent in from the right and is lucky that the ball is prodded behind for a goal kick. "Wycombe have got the goals and they've taken the sting out of this game. They simply don't look like conceding. "The Plymouth supporters are as quiet as they've been all night and the home team's substitutions have had little effect so far. "The Chairboys have shown a ruthless edge - a fourth goal would really put the Pilgrims to the sword." Off comes the outstanding Aaron Holloway and on comes Peter Murphy for Wycombe. "It's brilliant for Wycombe. I've been there as an away player and a home player. It will be a hard place to go on Thursday. Their tails are up and they'll be 3-0 up at home. All they've got to do is see it out, and the way this back line is playing, you'd think they'd do that straight away." There are plenty of glum faces among the home supporters. There was so much excitement in the build up to this game but they've seen their side struggle to create any clear-cut opportunities. That was a bit of frustration there from Plymouth's Lewis Alessandra. The striker slides in on Joe Jacobson and is booked. "A lot of people have been talking about Onyedinma. He's got a lot of pace and there's a lot of excitement around this kid. Eight goals already in such a short career is very, very good." Wycombe's third goalscorer Steven Craig is coming off. He's being replaced by 18-year-old Millwall loanee Fred Onyedinma. Plymouth's players look a bit dejected now but they need to find a spark from somewhere in this last 20 minutes. One goal would give them at least a little bit of hope to take to Adams Park on Thursday. The ineffective Reuben Reid comes off for Plymouth and is replaced by Ryan Brunt. It's fair to say the Pilgrims' top scorer hasn't had much service tonight. Another chance for Wycombe and it's Aaron Holloway again. He picks up the ball on the edge of the box and blasts a shot just over the bar. It must have taken a deflection as a corner is given but it comes to nothing. "For a side that has kept 21 clean sheets in the league this season, Plymouth are looking extremely fragile at the back. "Since Paul Hayes' half-time substitution, Sam Wood has moved up top with Matt Bloomfield coming into midfield, and Wycombe have continued to outwit the hosts. "It puts the Pilgrims in an unenviable position - do they go gung-ho and try to get to within touching distance for the second leg, or are we approaching the damage limitation stage? "The wooden dug-outs at Home Park make it impossible to see, but the Wycombe bench must be in dreamland." Suddenly this game has boiled over and both sets of players are clashing in the middle of the pitch. It was sparked after Plymouth's Anthony O'Connor appeared to go in with his elbow on Matt Bloomfield. O'Connor is booked. Very lucky not to see red there. Alex: 3-0!! Come on Wycombe!! Make this safe now!! Phenomenal turnaround in fortunes this season! Ainsworth needs a statue built!! Andy: I don't expect Plymouth to get back into this as Sheridan doesn't do plan B's. Tie over? Use #bbcfootball on Twitter. Plymouth need some attacking options here. They bring on Jason Banton and Zak Ansah for Carl McHugh and Gethin Jones. "How you concede that is beyond me. They gone to sleep and we've talked about them switching off in the first half. They switched off again, a simple ball and nobody goes across to Craig. It's a great finish but you've got to be marking him." Oh dear, Plymouth's defence has completely switched off there and this tie is as good as over. Wycombe have a free-kick close to the halfway line, Sam Saunders plays it quickly straight through the defence to Steven Craig in the box and Craig finishes past Luke McCormick. First chance of the half falls to the visitors. Aaron Holloway knocks the ball back to Sam Wood on the edge of the box but he scuffs his shot wide. I wonder what John Sheridan said to his players at half-time? They certainly need more from 20-goal striker Reuben Reid. He hasn't really been in the game so far. We're back under way at Home Park. What a huge half for Plymouth Argyle - you feel they need at least one goal to keep themselves in the tie. But we've already heard that Wycombe's away record is superb this season. Someone needs to step up for the Pilgrims. Wycombe have made a change at half-time. Midfielder Matt Bloomfield is coming on for goalscorer Paul Hayes, who's sitting on the bench with a huge bandage around his head. Alex: Wycombe cannot afford to settle for 2 goals, given last week's result. Need to make this comfortable early. Great first half! Drew: This one's finely poised. Either Plymouth get a goal back and it's all on again, or someone gets a silly second yellow and it's all over. Plymouth have very, very rarely come from behind to win under John Sheridan - but a goal or two would make the world of difference. Preston take a 1-0 lead into their League One semi-final second leg against Chesterfield, courtesy of their win at Proact Stadium on Thursday. Kick-off at Deepdale is at 12:15 BST. At 18:35 BST, Stevenage and Southend play the first of their League Two tie. There's live text commentary of both games here on the BBC Sport website. So it's advantage Wycombe at half-time. Will they hold on at Home Park, or is there a way back for Plymouth? Get in touch using #bbcfootball on Twitter. "The sun is beginning to set at Home Park, but are Plymouth's promotion chances also fading into the darkness? "There's no away goals rule in the play-offs, but the Chairboys are executing the perfect away performance here. "It's the 800 Wycombe fans who are making all the noise, and history could be repeating itself - the home team has failed to score in the last five games between these sides." The boos were ringing around Home Park as the players walked down the tunnel. The home fans clearly weren't happy with referee Peter Bankes following Wycombe's second goal in which Steven Craig appeared to handle the ball in the build-up. They will need to get behind their team in the second half though, otherwise this tie could be done and dusted. "I've been in one of those rollockings from John Sheridan and he'll be getting in people's faces. He can lose his rag for the right reasons, because Plymouth have been second best. "Gareth Ainsworth will say 'more of the same' because they're in the driving seat and they'll have to have a really drastic change as a group to lose this one." Bobby Reid launches a free-kick into the box but once again a Wycombe defender clears the ball behind. The corner is whipped in towards Anthony O'Connor but he can't connect and the ball goes behind. That's the final action of an eventful first half. Wycombe's Sam Saunders is booked for not retreating at a free-kick. Bit silly that. There will be three minutes of added time. Can Plymouth find a goal before the break? The Pilgrims are camped in Wycombe's half but are lacking a bit of quality in the final third. Wanderers' defenders are keeping things extremely tight though as they continue to throw their bodies in front of every shot. "When Wycombe have attacked, they've had four or five players around the box and in the final third. When Plymouth have attacked, they've only had one or two to shoot or slot balls down the sides of defenders. It's just not good enough." Sul: Gareth Ainsworth has done an amazing job turning Wycombe Wanderers around. Trev: With Wycombe's crazy away record this is the equivalent of a home tie. I don't think they should settle for 2. Plymouth are doing everything they can to try and pull a goal back before half-time. Bobby Reid picks up the ball outside the box and fires a shot towards goal which is blocked by a Wycombe defender. There are appeals for handball but the referee waves them away. "It's probably fair to say that the Plymouth supporters are not best pleased with referee Peter Bankes. "Firstly, he allowed Aaron Holloway's strike to stand, despite what appeared to be a handball in the build-up from Steven Craig. "Minutes later, he booked Argyle defender Carl McHugh - correctly - for patting the ball with his hand onto the Wycombe bar. "Whichever way you look at it, visiting left-back Joe Jacobson is causing havoc with his set-pieces. In fact, every chance in the game so far has come from a lofted ball into the box." Alex Lynch has done well there. Plymouth's top scorer Reuben Reid sends a hopeful ball down the middle and Lewis Alessandra sprints to try and get on the end of it. But the 20-year-old keeper rushes out and just beats him to claim the ball. John Sheridan's side have been showing plenty of attacking intent but are yet to register a shot on target. Remember, Wycombe's goalkeeper Alex Lynch is making his first start tonight and they will surely want to test him sooner rather than later. Kelvin Mellor bursts into the box for the hosts and prepares to shoot but is tackled by Sam Wood and goes down. Appeals for a penalty, but the challenge looked clean. Wycombe fans will be very confident that their team, who lead 2-0 after half an hour, can see the game out at Plymouth tonight. Their side has won 13 times on the road in the league already this season and picked up more points than any of the other 91 sides in the top four divisions away from home. Carl McHugh is booked for Plymouth. He rises highest from a corner but uses his hand to send the ball onto the crossbar and over. Tom Reyner: What a turn around for Wycombe in one season. One game from relegation and now potentially on the brink of promotion. Magical. I've got a feeling this second goal from Aaron Holloway could cause some debate. Your view on it? Tweet using #bbcfootball. Plymouth's players have to get that moment of controversy out of their minds quickly. A third goal for the visitors and this tie could be over before it's even begun. "Holloway, who's been lively, got his shot off and it's a great strike into the bottom corner. "One team reacted, one didn't. I don't think it was a foul. It was a strong control of the ball. Yes, it hit his shoulder and went down, and the lad reacted to it and did well. "For me, it wasn't a free-kick or handball." Aaron Holloway makes it 2-0 to Wycombe with a fine 20-yard strike into the bottom left corner, but there is plenty of controversy surrounding it. Plymouth players surround the referee after it appeared Steven Craig controlled the ball with his hand or arm, and then passed it back to Holloway. Replays suggest Craig did handle it. Approaching the midway point of the first half and things are going according to plan for Wycombe, who lead 1-0. Hard to imagine that a year ago, they were battling to stay in League Two. It's been some turnaround this term. Plymouth are pushing forward in search of an equaliser. They keep whipping balls into the box and Wanderers replacement goalkeeper Alex Lynch looks unsure whether or not to come for the ball. The Pilgrims fans continue to be in fine voice despite their side trailing. "Plymouth came racing out of the blocks, feasting off the energy of this capacity Home Park crowd, and it looked like Wycombe might be overawed. "However, the visitors absorbed the pressure and have grown into the game - getting their reward with Paul Hayes hooking the ball home. "Hayes spent an unsuccessful loan spell with the Pilgrims and the former Scunthorpe man was only too pleased to celebrate in front of the home faithful." Plymouth look a bit shell-shocked following that Paul Hayes goal. The 31-year-old played seven games on loan for the Pilgrims in 2013 but failed to find the back of the net. "A fantastic corner, great execution and very sharp from Paul Hayes. He's been a fantastic servant for most clubs, and especially Wycombe. "Well deserved for Wycombe - they've shown some good flashes." Wycombe Wanderers take the lead and it's former Plymouth striker Paul Hayes who has got it. Joe Jacobson sends in a corner, it's headed goalwards and Luke McCormick makes a fine save, but Hayes is there to smash the ball into the net from close range. Wycombe finally launch their first attack of the game as the ball pinballs around in the box before Marcus Bean fires a shot over the bar from 20 yards. "Gareth Ainsworth's going nuts down there because the two centre-backs should have dealt with that. "The two centre-backs for Wycombe have been fantastic all year. Mawson and Pierre have been the main men in this division as far as centre-back partnerships go. "Marcus Bean's been a fantastic asset - a steady midfielder who's now at right-back, probably because he's slowed down a tweak." It's all Plymouth in this opening five minutes. Kelvin Mellor sends over a cross from the right and the returning Lewis Alessandra stoops but sends his header over the bar. The home fans are in fine voice, encouraged at the start their team has made. First touch of the ball for Wycombe goalkeeper Alex Lynch. Gethin Jones whips in a cross but straight into his hands. Nice and easy. "The goalkeeper, Alex Lynch, was coming and going and coming and going for a cross. He looked a bit panicky for me, which is a worrying sign." Bobby Reid bursts down the left for Plymouth and wins an early corner. The ball is cleared and hoisted straight back in but Curtis Nelson heads wide. Young goalkeeper Alex Lynch was under a lot of pressure there. We're under way at a packed Home Park. Tremendous atmosphere. Everyone knows what is at stake here. How are your nerves then? Spare a thought for Wycombe goalkeeper Matt Ingram, who misses tonight's game with a knee injury picked up in the final day win at Northampton. He'd played 111 consecutive games for the Chairboys. What a night for his replacement though. He's 20-year-old Alex Lynch, who's been on loan at Burnham in the Southern League this season, but is now playing in Wanderers' biggest game of the campaign. "I do think Plymouth will win this game tonight. Wycombe are a fantastic side and they've had a fantastic season, but they're batting above their weight if I'm honest. "The fans have come down in their droves from Wycombe and it's filled the place." Follow every kick of every play-off game here on the BBC Sport website. We'll be providing a live text commentary of every match, including all three Wembley finals on 23-25 May. You can listen to live commentary of Plymouth v Wycombe on BBC 5 live sports extra this evening, and also via the Live Coverage tab on desktop, tablet and mobile devices. Guy Branston, who played for both clubs during his long playing career, is part of the commentary team at Home Park. surprise package for many this season. The Chairboys endured a difficult 2013-14 campaign, which saw them finish 22nd in League Two, and they were among the favourites to be relegated this year. "Dreams of the play-offs were almost fantasy at the start of the season, so to achieve that is fantastic for this group of boys," Ainsworth told BBC Three Counties Radio. "There's no way I'm thinking of Wembley yet, it's Plymouth, Plymouth, Plymouth. Getting a result down there and coming back and finishing the job at Wycombe." "It's a feeling I haven't experienced before - the atmosphere is absolutely brilliant, the pitch looks great, it's just absolutely wonderful. "I absolutely happily continue to believe that Plymouth Argyle will be back in the Championship in a reasonable period of time - promotion may happen this season, it might not - but this is just a step to getting back to where we belong." enough quality to win the League Two play-offs. The Pilgrims, who claimed the final play-off spot, finished 13 points behind fourth-placed Wycombe. "I expect and am confident that we'll be the team who win it," Sheridan told BBC Sport. "I definitely think we're good enough to get out of the division - my aim was to get in the play-offs, but now we're here I want more." "Wycombe may feel they shouldn't be scrapping it out in the play-offs for promotion. Only MK Dons (in 2006-07) have failed to go up automatically from the bottom division of the Football League with the 84 points they achieved this term. "The Chairboys have a reasonable play-off record, beating Preston 4-2 in the 1993-94 final to lift them into the third tier. Wycombe have fallen at the semi-final stage on two occasions, however, most recently to Stockport under Paul Lambert's management." "Plymouth haven't experienced the play-offs for 19 years. They lost in a 1994 semi-final with Peter Shilton in charge, but the Pilgrims had more luck in the 1995-96 season as Neil Warnock led them to glory at the old Wembley, beating Darlington 1-0. "The play-offs were first introduced in 1987 and Plymouth manager John Sheridan scored in the Second Division final for Leeds, although they eventually lost against Charlton after two legs AND a replay. "Thankfully the final is a one-off affair nowadays..."
If you were going to place a bet on tonight's result, it might be safer to leave your cash in your pocket. With one win each, are we looking at a draw tonight? It's 19 years since Plymouth fans have seen their team in the play-offs, but few can deny they deserve another chance at promotion this season. The Pilgrims conceded just 37 goals, the second fewest in League Two, and were in or around the play-off places for most of the campaign. Wycombe supporters, on the other hand, may feel a little disappointed they are not preparing already for life in League One. Gareth Ainsworth's men were in the top three from mid-September until mid-April but one win from their final three matches saw the Chairboys finish in fourth. We already know that Burton, Shrewsbury and Bury will be plying their trade in League One next season. But four teams are still in with a shot of joining them - Plymouth, Wycombe, Stevenage and Southend. Who do you think will go up through the play-offs? Let us know via the BBC Sport Facebook page or by using #bbcfootball on Twitter. 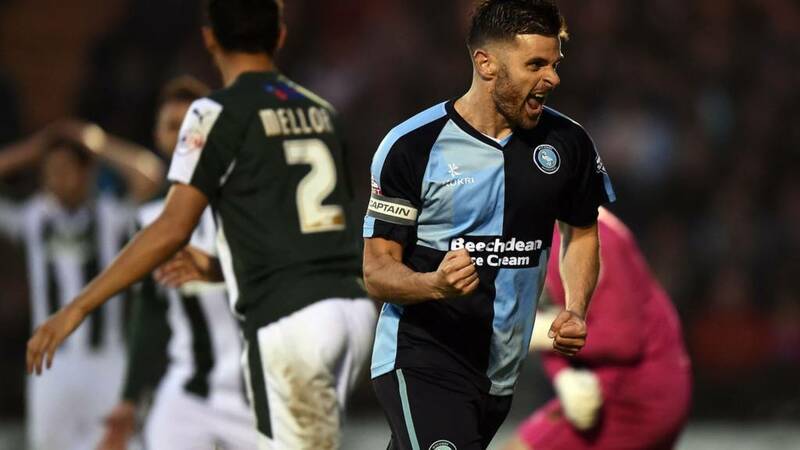 The League Two play-offs get under way tonight at Home Park, with fourth-placed Wycombe heading to Plymouth, who ended the season in seventh. Tomorrow, it's Stevenage v Southend in the other semi-final. At stake is a spot at Wembley on 23 May, and the winners there will go up to the third tier. Both Championship play-off semi-finals appear finely balanced going into next week's second legs. a 2-1 victory at Brentford on Friday, but the Bees' second-half display proved they have the ability to turn the tie around at Riverside Stadium. played out a 1-1 draw at Portman Road. 1-0 win at Chesterfield on Thursday. Avoid defeat at home tomorrow lunchtime and they'll be in a Wembley final, as they look to put right their dreadful play-off record. a late 2-1 win at Sheffield United and will fancy their chances of finishing the job in Monday's second leg. Plymouth Argyle: McCormick, Mellor, Nelson, Alessandra, R. Reid, Holmes-Dennis, McHugh, B. Reid, O'Connor, Jones, Hartley. Substitutes: Bittner, Purrington, Banton, Blizzard, Harvey, Ansah, Brunt. Wycombe Wanderers: Lynch, Bean, Jacobson, Mawson, Pierre, Saunders, Yennaris, Wood, Craig, Holloway, Hayes. Substitutes: Horlock, Fletcher, Bloomfield, Murphy, Ephraim, Kretzschmar, Onyedinma. Plymouth have made three changes to the side which won at Shrewsbury on the final day. Lewis Alessandra and Reuben Reid are back up front for the Pilgrims and Gethin Jones comes into midfield. Ryan Brunt, Zak Ansah and Dominic Blizzard drop to the bench. Wycombe goalkeeper Matt Ingram misses out through injury, so Alex Lynch replaces him between the sticks. Manager Gareth Ainsworth makes three changes in total to the team which won at Northampton last weekend. After all the fun of the final day for Plymouth fans, it's now down to the serious business. The fancy dress from the win at Shrewsbury is back in the wardrobe, as we get ready for the first League Two play-off semi-final. Spare a thought for Wycombe supporters who saw their side just pipped to an automatic promotion spot by Bury, but you can be sure they'll be up for another crack at promotion via the play-offs. Who's ready for another night of drama?